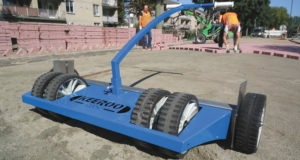 The Keeroo is a convenient, effective and multifunctional hand grader for pavers. The Keeroo could be used to level the ground before it will be paved. 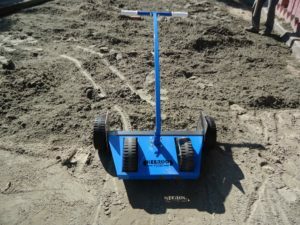 With this device you level the sand bed, which serves as the base for paving, fast, smooth and tight. First of all, the Keeroo is time-saving: you work more efficient. The Keeroo prolongs the working life of the paver/bricklayer: in a standing position you pull the Keeroo and walk backwards. Your knees, shoulders and back will be less burdened. The excess sand is easily moved to the lower parts so the subsoil becomes all at the same level. The Keeroo ensures an even bed and because of the robust wheels there will barely be grooves in the sand beds. To sweep the sand between and in the paving, the Keeroo sweeper is the right solution. The Keeroo sweeper can be placed in both Keeroo 700A and Keeroo 1200A and be used for both push and pull.